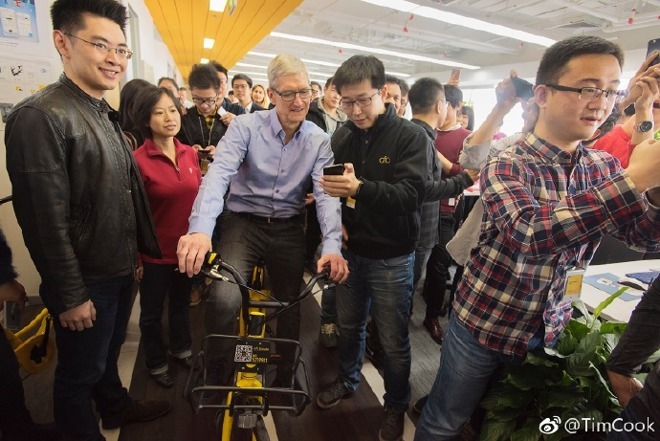 As part of his latest trip to China, Apple CEO Tim Cook on Tuesday visited bike-sharing startup ofo and fitness company Keep, also announcing that a translation of Swift Playgrounds into simplified Chinese will be released tomorrow. Cook posted details and photos of the day on Chinese microblogging site Sina Weibo. The executive praised ofo for its "mission to make commuting greener, more efficient and fun," and Keep for hitting 80 million downloads. One Ofo investor, notably, is Didi Chuxing, into which Apple invested $1 billion in May 2016. Apple likely also has an interest in Ofo because people can find, unlock, and rent bikes using an iPhone app. Over the weekend, Cook attended an economic forum sponsored by the Chinese government. During the event he promoted globalization, while being careful about topics like privacy and encryption —things the Chinese government is sometimes leery of, especially under incoming laws that require major tech companies to aid in investigations. 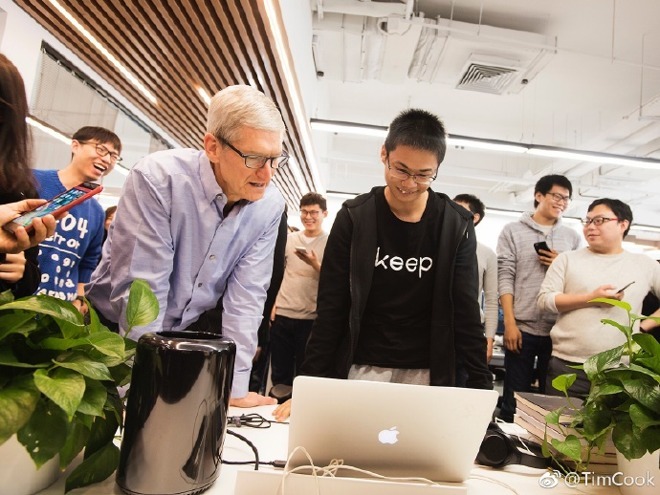 It's not clear how much longer Cook will be in China, but the executive has stayed for several days in overseas destinations like Europe and India.